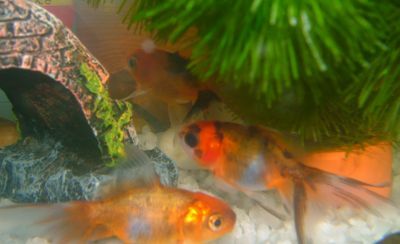 The primary kids have some new pets: Three goldfish named Pinky, Blackie, and Pumpkin! Pinky is in front, Blackie is in the middle, and Pumpkin is at the back. The kids chose the names and they are good at remembering which one is which. They are going to watch the fish as they get used to their new habitat and take note of where the fish like to be. As soon as we put them in their new tank last week, they learned how to swim under the bridge. Smart fish! See them in action in the video below. Pinkie’s a bit a of a superstar. She likes to play for the camera while the other two are more interested in eating.